Once I had finished the course I wanted more. The sensation of being underwater is incredibly addictive. Terry suggested that a good way to feed the habit would be to do the next course, Advanced open water. You get to do 5 dives, each with a different speciality. No classroom work. 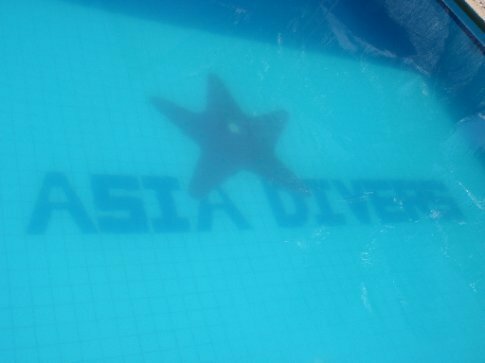 The price of the course was comparable to doing five fun dives and Asia Divers were throwing in two more nights accommodation. Sounded like a pretty good deal to me. Terry had to go to Koh Samui to do a visa run so if I wanted him as an instructor, which I did, I could start in 2 days. 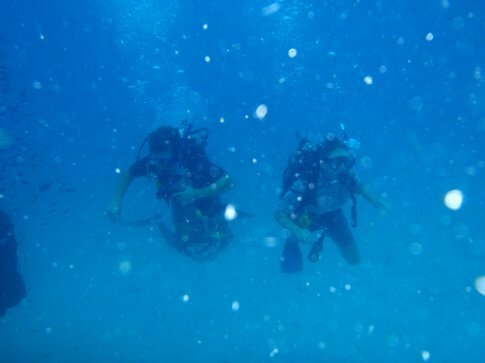 This was perfect as it would allow me some time off diving and Claire and I to see a bit more of the island. Almost everyone on the island gets around on some variety of moped or motorbike. Neither of us were keen on this. Taxis were too expensive. Walking was too slow. An elegant solution presented itself in the form of a quad bike. It had also been a while since we had a new mode of transport. We rented MOT number 38 in the town very easily. No questions asked – I dont have any kind of license. A quick 30 second lesson and we were off. They're great fun to drive and very easy. You just need to make sure you position the weight forward when going up steep hills so it doesn't topple back over you. I think this is what happened to Ozzy Osbourne a few years back. A few of the people who lived on the island long term had said that Shark Bay, on the southern tip, was good for snorkeling and for a day on the beach. They also mentioned that you had to climb over a wall to get to the beach itself but we were a bit hazy on details. 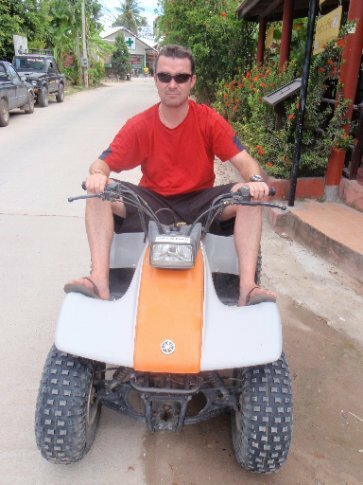 We went as far south as the quad bike would take us, down to the sea through some pretty bungalows. The beach was a few hundred metres to our left but the only way to it was to scale across a large collection of smoothly rounded limestone boulders. I chose to go over, Claire around, by the sea, almost losing a flip-flop in the process. But it was well worth it. The beach was picture perfect. The coral was a bit too easily accessible though, in less than knee deep water which made it hard to avoid the ubiquitous pointed black sea urchins. Afterwards we went for a bit of a jaunt around Mae Had Town where we had arrived. Not too much to see although it did confirm that we had been much better off up in Sairee. We headed back north and carried on, beyond Sairee up to the northern tip, or rather as far as the road would allow us. A sign told us <no motorbike allowed>. We weren't sure if that included our quad bike but alighted just in case. A steep path lead to a beautiful plush resort. Definitely the type you would stay in on a 2 week holiday. 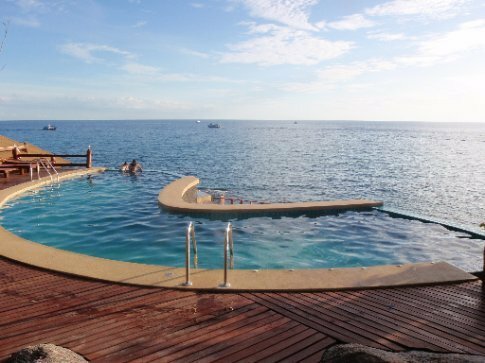 It had an amazing raised pool with a view over to NangYuan Island. Really idyllic place ... with lots of loved up couples with shiny new rings on their fingers. But not for us in backpacker mode. Maybe some day. Back at Asia Divers Terry and Haruna were at the bar, back from Koh Samui with freshly stamped passports. They invited us out to dinner to a DIY Korean BBQ called 139 Gold. So-called because it costs 139 Baht for an all you can eat feast. Earlier in the season it was called 99 Gold but it seems inflation happens on Koh Tao as well. It was a lovely evening: great food, great company and for the first time in my life I was the designated driver which was a definite novelty. We finished proceedings back in Lotus bar, bumping into Angus and a few of the lads on a complete mission, buckets in hand. We made our excuses and left them to it. Steve, a comedic English guy did have a story worth retelling however. He had been at the full moon party on Koh Pha Ngan, the next island down. He had been asked to join in a game: flaming skipping rope. It ended as you can probably imagine, with the flaming rope catching on his foot but he was too drunk to fully acknowledge the pain. He hadn't been able to dive for three weeks as a result. He said that under normal circumstances he would always say no to that sort of invitation, but the full moon party does crazy things to people. 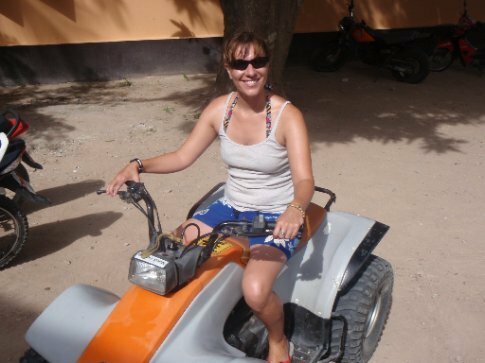 We got up early the following morning to make the most of the quad bike and see some of the west of the island, plus it was Claire's turn to be at the helm. She had loved the vibe (!!) of riding pillion but wasn't so fond of being in front. The road was much rougher too. I took over and found the going too tough as well. We turned back and went for a bit of a spin around instead. It was fun but I had more diving to do! Ian hadn't been feeling the best so had passed up on the course. There were no other students (I reckon Ian might have been persuaded to do it if the Swedish national beach volleyball team was doing it) so I was receiving one to one tuition with Terry, Oli, as ever assisting. It was great to be out with familiar faces too. Claire came along too. 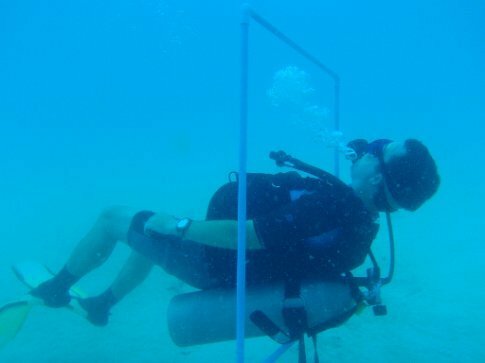 The first dive was peak performance buoyancy which was all about getting me to manage my buoyancy better and do a few maneuvers through a plastic square. Then a bit of hovering and finally a fun dive. Terry also took down my camera which I was very happy with managing to work and take photos at 12m. Afterwards we went to Three Rocks for the navigation dive. Of the five dives two are compulsory and this is one of them. I had to work out how fast I swim and then navigate around a big square using a compass. I got back to square 1 without too many problems, although I suspect luck was on my side as much as successful compass skills. I was starting to appreciate the underwater world around me by this stage. Lots of pretty Angel and Banner fish. One of the DMTs (Dive Master Trainees) was a girl from Tallaght in Dublin called Danielle. She had been a hairdresser for a long time and as Claire was in need of a trim, I introduced her to the word nixer. A nixer is a job on the side, cash in hand. A lot of hairdressing nixers were performed in my parents over the years. Danielle did Claire a nixer on the veranda of our room during the afternoon. 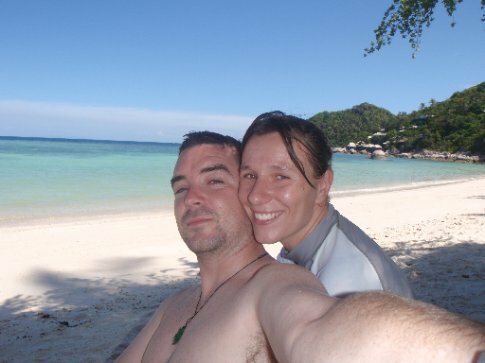 Danielle said that her mother (who owned their salon in Tallaght) would kill her if she knew what she was charging in Koh Tao for a nixer. She had priced herself a touch above what the local salon were offering so she was obviously a savvy businesswoman. 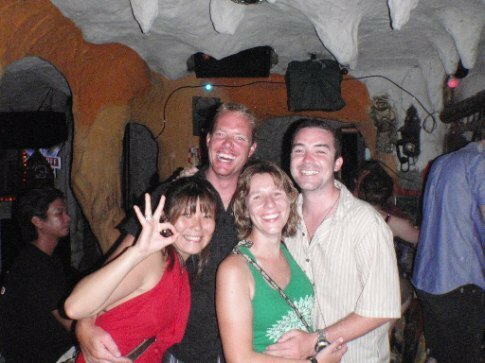 The joke around the bar was that Danielle would be heading up the entire PADI organisation within less than a year. The Lions were playing the second test against South Africa that evening. There was a big crowd of fans for both sides down at choppers, a bar in the village with free wifi and good food specials which Claire and I had frequented a lot. We got seats at the bar early and tucked into an indulgent surf and turf ( it was on special!). As we were eating the usual suspects from Asia divers crammed in and the game started to much banter and anticipation. Will, one of the senior instructors was a big boks fan and there were a lot of English military guys training to be instructors. One of them was beside Claire at the bar for the first half. As the second half went on and the game got more stressful he got more agitated, eventually squeezing Claire off her chair before elbowing her. It wasn't malicious - all of this went on while he was completely unaware of his own actions. I don't think he'll make a great instructor... The Lions lost but it was a great game. We cleared off pretty soon after it finished. Up early for a dives 3 and 4 the next morning, multilevel and computer diving and deep diving. The first one, as you can imagine involved diving with a computer which I rented from the dive shop. Most importantly it showed me how it was possible to avoid using the dive tables which had caused me trouble in the Open Water exam. 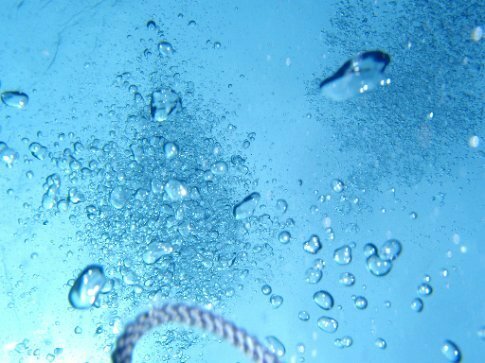 The main reason people dive using computers is that they are much more accurate regarding the amount of nitrogen you have in your system, and therefore how long you can remain under. The tables assume you dive right down to say 18m, stay there for an hour and then come straight back, whereas in reality its more of a curve. 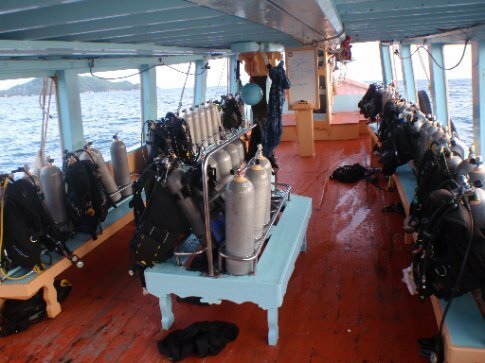 The upshot is you get more time diving which is what every diver wants. I also had to lead the dive which obviously I had never done before. I took us around 2 large rocks in a figure of eight back to the guide line. Terry said afterward that actually I had gone around in 2 big circles, cheating but hey. I have to say I much prefer following someone looking out for cool stuff else to keeping an eye on the compass and looking around making sure your group are following you. More fun and easier. The site was shark island. We went a little deeper than planned – Terry had found a memorial to a diver who had died here a few years ago and wanted to point it out to us. An hour later the boat took us down to South west pinnacle a good 15km away from the island for the deep dive, the second compulsory dive. Up until then I had been to 18m, the maximum depth for my level. The deep dive took me to 30m. To be honest the depth didn't seem to make that much difference – it certainly didn't feel any deeper but the site and visibility made it the best dive I had done so far. I had my first encounter with Triggerfish which are habitually territorial and aggressive but thankfully this one was placid. 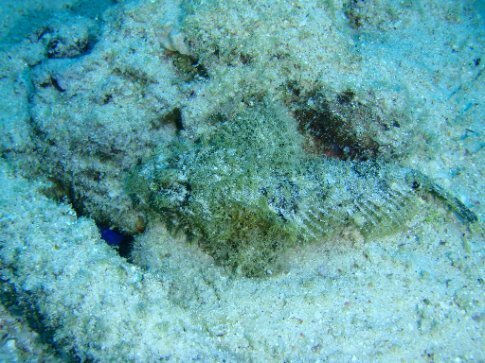 We came across highly poisonous and very well camouflaged scorpion fish. Large groupers flitted about, grazing on the coral while Blue Spotted ray majestically floated along the bottom. It was amazing. While the deep dive was exhilarating, the next and final dive of the course was very different and presented some challenges. It was that evening and it was my first night dive. The boat left the harbour close to six in the evening, as the sun was beginning to set. 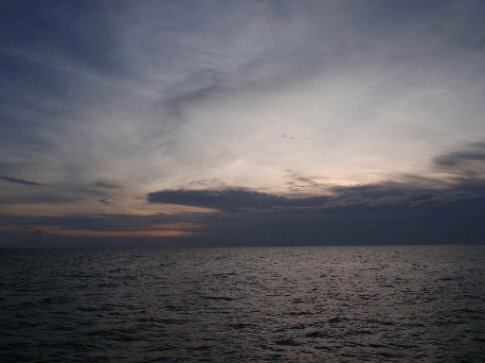 It was quiet – there were only about ten of us on the boat and there wasn't the usual drone of twenty other diving boats around us. At dusk we began our final preparations and giant-stepped in. The main rules of doing a night dive are to be familiar... with your fellow divers, with the dive site and with your equipment. It all makes sense. We all had torches but even still I felt quite a bit more disoriented than usual, even though there was still the half light from dusk to peer through. Once on our way I started to feel a little better. Terry had given me a loan of a compass from the shop which I had only used once, on the navigation dive. He turned around at one point and asked me where it was. I had no idea – it wasn't on my arm any more. It must have fallen off at the put in. This put me more on guard. 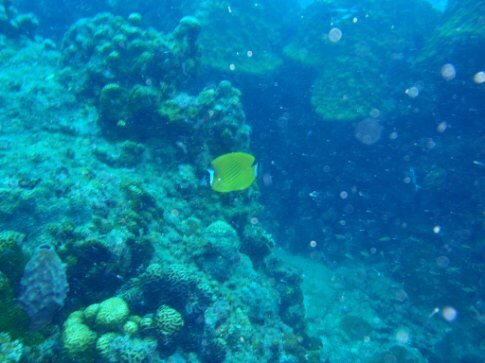 I found it hard to manage my buoyancy and my breathing wasn't as calm as it had been even earlier in the day. Eventually I did start to enjoy it. A few blue spotted ray came straight for us and then dipped down at the last moment – very unusual for them. I spotted a large hermit crab wandering, snail-like along through the sand. We saw a puffer fish (unpuffed). At about 30cm it was much larger than I expected. The highlight has to be the Great Barracuda. They're very smart predatorial fish who like to follow night divers around. Just as the diver uses a torch to point out interesting fish, the barracuda uses the light to identify dinner. The one that accompanied us was large by the accounts of the more experienced divers .. about 2m long. At the end of the dive, in almost complete darkness the barracuda darted into Terry's light 3 or 4 times within the space of a few seconds and gobbled fish whole. It was an amazing sight to see. Back on the boat we drank a few beers that Terry had been keeping cold in his wetsuit (onboard!). 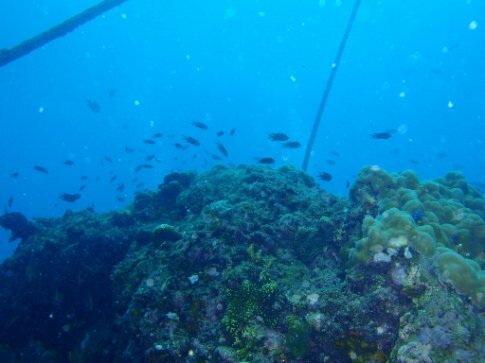 I had unfortunately come to the end of my diving in Koh Tao. Claire and I had a quiet night, ending up in a pasta restaurant in the beach. They closed up just after serving us, thankfully they left us a light on so we could see our food. Our last day on the island was ironically our first full day on the beach. We found a shady spot under a coconut tree and whiled the hours away trying not to get burnt. 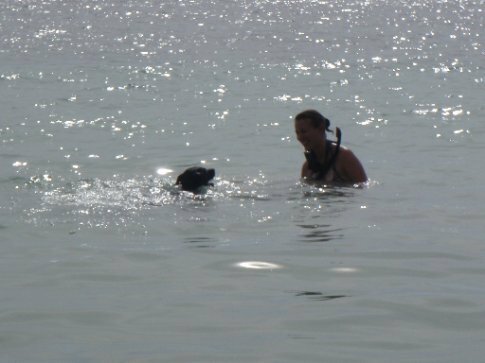 While Claire was paddling a dog joined her, a lovely Black Labrador. All he wanted to do was paddle and chase handfuls sand. Not the smartest dog but lots of fun. Surprise surprise there was a party to go to on our last night. It took place in a bar further down the beach which looked like something out of the Flintstones. 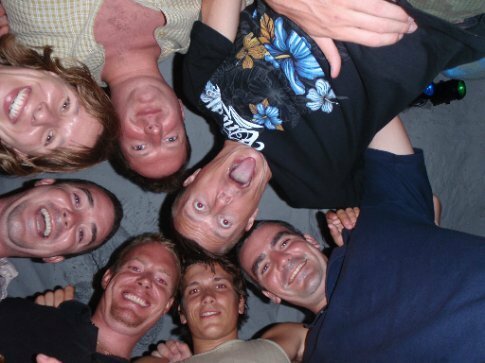 There was a good crowd from the dive school out and we all ended up in Lotus bar. It was sad to have to leave them, to leave the little community which had formed. It was one of the first times we had had a circle of friends, people to meet on the street, a bit of gossip, since we had left. And it felt good. But such is the way of travelling ... you have to move on. But I hope we'll keep in touch.